Use the form below to send me your comments, suggestions, questions (and even corrections, please!). Using the form below is the way to contact me confidentially. Of course, if you check the box that says it's okay to share your message or info, then I may do so to help other readers. You can also get in touch with me by leaving your comments in the Facebook Comments option below. You can do that here or on other pages of my site. And you can communicate with me on my Facebook page. Don't forget to "Like" me while you're there! If you own a website about teaching English and would like to explore a possible link partnership, please submit your site. 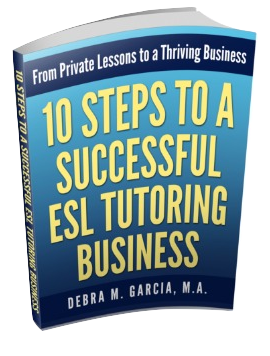 My name is Debra Garcia and I'm an ESL tutor. I've been privately tutoring students for over 10 years. Click on this link if you'd like to learn more about me and this site. Y'all Come Back Now, Here?! Yes, it's OK to post my message and country, but not my name. Please note that I will never, ever, ever sell or give away or tell anyone else your email address! The information you send me is 100% confidential, unless you check one of the above buttons. Then, I will only post the info you gave permission for, but I will never post your email address. I dislike spammers immensely and I don't want them to have your email address!